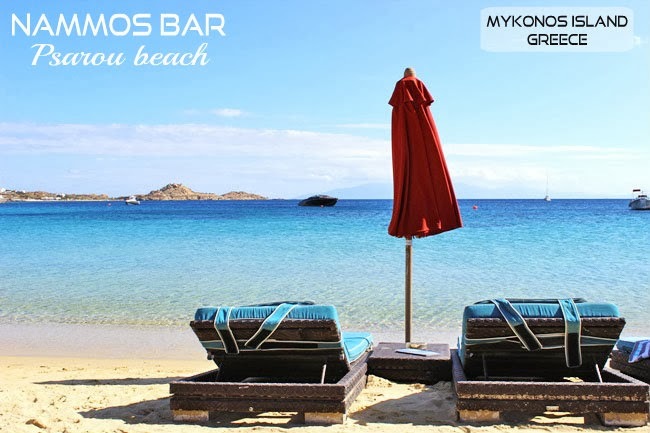 Nammos bar is located on Psarou beach, one of the most beautiful beaches of Mykonos. Jet-set history of this place begins in 2003 when Nammos was publicly opened, and this year it celebrated its 10th anniversary. Each summer this spot gathers all "small and big stars" whose lives the tabloids are so curious about: actors and actresses, models, singers, tycoons, starlets, and all those who are "publicly known, for any reason"... Of course we're talking about the high season, because after September you can barely see them. Nammos bar se nalazi na Psarou plazi, jednoj od najlepsih plaza Mikonosa. Dzet-set istorija ovog mesta pocinje 2003. godine, kada je Nammos javno otvoren, i ove godine je proslavio svoju 10-godisnjicu. Iz leta u leto ovde se okupljaju sve zvezde i zvezdice cijim se zivotima tabloidi radoznalo bave: glumci i glumice, modeli i manekenke, pevaci i pevacice, tajkuni, starlete, i svi oni koji su "javno poznati iz bilo kog razloga"... Naravno sada govorimo o jeku sezone, jer ih nakon septembra skoro i nema. Deliciously sweet style, and these pictures of lovely Psarou Beach are as lovely as you are.